This simple soup is so creamy and delicious, perfect for a light Spring meal. Chop onions, celery, and parsley; set aside. In large bowl, mix together onions, parsley, celery, creamed corn, frozen corn, and broth. Before you are ready to serve: drain clams and add to slow cooker, wait 3 minutes then stir in whipping cream and butter until butter melts. Add salt and pepper to taste. 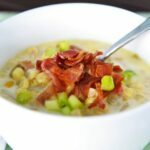 Ladle into bowls and top with crispy bacon (optional) and green onions.